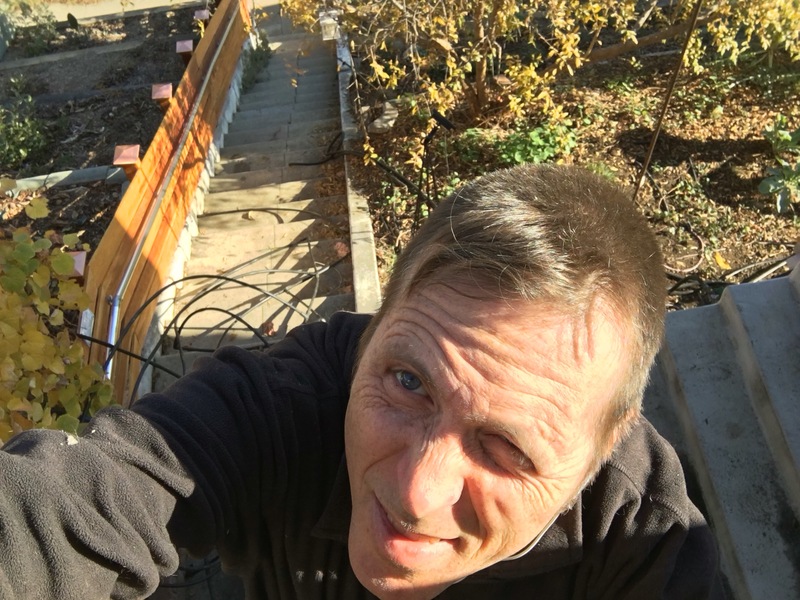 We begin this post with a gutter cleaning selfie showing the precipitous drop from the front of our house as well as a view of the “flipper fence” handrail I built for the in-laws. The much promised El Niño rainstorms are on our doorstep this week. For those of you in the rest of the world who might be unfamiliar with the phenomenon, every decade or so weather conditions in the Northern Pacific conspire to heat up the ocean which, in turn, causes unusually heavy rainstorms to hit California. Climate change only makes this condition worse. Cleaned the gutters and French drains. This is no fun, especially since the gutters on the front of the house are difficult to access. I discovered that the front gutter was completely clogged with loose asphalt roofing material. Channeled some of the water from our gutters to the backyard garden. Since our house is on the hill I have to send the rest of the water down to the street, unfortunately. Made sure to have working flashlights with fully charged batteries. Our electricity has gotten increasingly unreliable over recent years. Charged the 2 meter ham radio (it’s also a scanner). Got a supply of dry goods that can be cooked without opening the refrigerator/freezer. Fixed the foundation (I did this ten years ago and am happy I did it, though it was expensive). One thing I still need to do is get a charger for my cell phone. If any of you have a recommendation I’d appreciate it. Other than pitch a Dwayne “The Rock” Johnson El Niño disaster movie is there anything else I should do? What have you done to prepare for El Niño? We have a couple of Goal Zero systems. The smaller one is a foldable to panel portable system we use in the car or backpacking to recharge cells. It has a 4 AA battery unit that can be recharged also. The bigger unit is a Yeti 400 that is charged by the wall or panels. We can set up 4 30 watt panels on a tripod and charge the Yeti power source. We can recharge phones and power lights as we had to recently. I like the flexibility of these systems. I highly recommend the Jackery Giant+ Dual USB Charger (http://www.amazon.com/Jackery-Portable-Battery-Charger-External/dp/B00EA1P8OI). I’ve used them on many camping trips to charge multiple devices, and they work great! Good luck with the El Nino y’all! Thanks for the USB charger tip! Something I’m doing, because I live in the California High Desert where organic matter is an anomaly, is spreading tons and tons of woodchips from a local tree service. Usually, in the dry desert wind, the chips wouldn’t really break down much. But, with the El Niño rains, I’m looking forward to creating lots of free composted mulch while also surpassing the abundant weed seeds from sprouting. Great tip, and something I forgot to mention. We have a lot of mulch too. What specifically did you have to do to fix the foundation for el Ninyo? I’m assuming your old L.A. house is on wood foundation (post and pier supports)? What needs to be done for those in newer concrete block foundations? Can you do a blog on various foundations (pros and cons) found in SoCal, and what needs to be done for disaster preparations, el Ninyo, earthquakes, etc.? The pipes in my home are incased in concrete, I’ve always wondered what happens when an earthquake hits and the concrete cracks, or w/out disaster, if pipes just start leaking from old age, how to you prepare for this? Hi Terry–we should do a post about our foundation! My best advice to anyone with foundation questions is to hire an engineer. That person can take a look and see if there’s a problem. If there is, the engineer can draw up a plan and then you can have contractors bid on it. That’s what we did on the advice of a real estate attorney after we bought this place back in 1998. Our house, built in 1920 had a crumbling concrete foundation as well as sections that had been replaced carelessly with concrete masonry units lacking grout and rebar. It was a mess. That the house is on a hill compounded everything. Not being an engineer I can’t speak to the various foundation types and how they will do in an earthquake. I do know that wood frame buildings tend to be safer and that the city has a lot of dodgy masonry buildings in need of reinforcement. I live in the San Juan Islands of the Pacific Northwest and deal with storms all the time. I’ve seen utility service loss for up to 2 weeks. While I do maintain a generator for longer loss periods these events are rare but 3 days is more common. We are invested in oil lamps and lamp oil. We even built our own oil lamp wall sconces to light our home better and have oil lamps for all our tables, 2 at the dinning table. They also put out a bit of warmth. Door draft guards: I bought dense upholstery foam, cut it down to fit in the front of my doors. If you close down rooms and keep your heat to a major area you can also cut the foam to install in your windows, just leave it a bit larger for a snug fit. Open under cabinets so pipes will not freeze. Board games:Chess,Checkers,Backgammon and card games. Large print reading books. Musical instruments and music books. A couple scented candles. I keep an emergency container of dried fruits, chocolate chips, and other goodies that do not go rancid. I keep a special ski bag of winter warm clothes. It’s a good time to put the thermals on the bed and get the goose down out and keep a Bennie hat at your bed side to wear when sleeping. Keep your ears warm. Also a bottle of Jegermitter and cinnamon whiskey wouldn’t hurt! I have several cell phone chargers, mostly bought cheaply at Walmart. The one I keep in the car has a connector that will plug into a house current. I pull out the cord and there is a usb connector. Basically, it can be plugged into the house, the cigarette lighter or a usb port. Plus, my car will charge the cell phone even if the motor is off. In the house, I have a cell phone charger that only plugs into the wall. Then, I have one I can plug into the usb port on my computer or alarm clock. I keep the most versatile charger in the car so that I can plug it in several places. When the tornado put out the lights for five days, I would charge the phone in the car and not have to drive to find a place to charge. Some cars will not charge unless the car is on. While solar would be great, I would never completely abandon my other chargers. My friend just showed this to me. We live in an apartment, so our prep is a bit different. We always have our propane camp stove and fuel. Lots of fleece blankets. Oil lamps,and batteries for the cheap radio. As Sheri wisely mentioned above, games,books, and entertainments are a must. Also, pet owners should think of pet food, litter etc. We are still working on water storage. We live in WA so getting to water may not be difficult, but drinkable water is another issue. We do much of the above for hurricanes in Nova Scotia. We also have those blue water containers for water, fill up the bathtub for laundry water, have shampoos that don’t need much water to get started or rinse out. We have two larger solar powered batteries for some low lights, a wind up radio and solar rechargeable batteries. We make sure to have the car filled with gas in case the power goes out in gas stations, but the car is not our main mode of transportation. It is for having to leave the city. We also have cash on had to replace bank cards. Enough matches? We used wool blankets to shut off rooms that don’t have doors and we also stocked up on cat litter and food. We buy extra fuel for the camp stove and a bag of briquettes and lighter fluid for the barbeque. and yes, we have a row boat in the backyard. We have a sump pump, a submersible pump, and a shop vac in case of basement flooding none of which will work without electricity. lots of rags. We also make sure the first aid kit and and medicines are up to date. The one thing I make sure I have before a big storm is pet food. In urban and suburban areas, we can pretty much always make do running down to the local pub or what have you, but the dogs and cats still have to eat!